What Is the Minimum Legal Working Age in Missouri? If you live in Missouri and can't wait to start your first job, your first challenge is to figure out if you qualify. Are you old enough to work? You need to know what the minimum legal working age in your state is. Expect your foray into the workforce to teach you life skills such as teamwork, reliability, conflict resolution, problem-solving and punctuality if you're old enough to wade in. You'll also be able to set some goals about what to use your new income on, whether it is for books, video games, music or savings toward a car or college expenses. How Old Must You Be to Work in Missouri? Both federal child labor laws and Missouri law agree that the minimum age to work is 14, but there are exceptions. Child labor laws in each state also typically indicate what permits are necessary before a minor can work. When there's a contradiction between federal and state laws, the more restrictive law applies, but this isn't an issue in Missouri because they match. Children younger than 14 can work in some capacities, such as casual work. This could include doing yard work or household chores for a neighbor. Children are also allowed to work in the entertainment industry in careers such as acting, singing, dancing or playing an instrument. 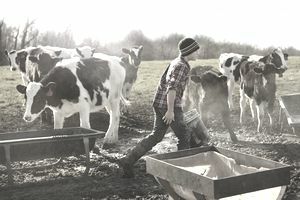 Child labor laws generally do not restrict children from working on a family farm or in a family business under the direct supervision of a parent, so the situation isn't dire for tweens and younger kids hoping to score extra cash. However, it is essential to review the rules and restrictions surrounding child labor laws when your child wants to work in more official capacities as he grows older. Missouri state law requires child employment certificates for youths under age 16. The school provides employment certificates. Kids younger than 18 will be provided with an age certificate as well by request, but they're not required to have one under Missouri state law. Teens ages 14 and 15 can work in a variety of jobs including in janitorial, food service, offices or vehicle cleaning occupations, but the hours they can work are limited. Youths at this age are prohibited from working more than three hours on a school day, more than eight hours on non-school days or more than 40 hours during a non-school week. During summers, they may not work more than six days in a row. These teens must work hours that fall between 7 a.m. and 7 p.m. except from June 1 through Labor Day. Working hours extend to 9 p.m. during these summer months. Missouri child labor laws do not apply to teens ages 16 to 17. Teens may not work in hazardous occupations that can potentially cause serious bodily harm, death or adverse health effects, including jobs that involve power tools or radioactive substances. For more information on the minimum age to work in Missouri and how to obtain employment certificates, visit the Missouri State Labor website.